I went for a photo walk with a friend earlier this week to find some autumn signs. 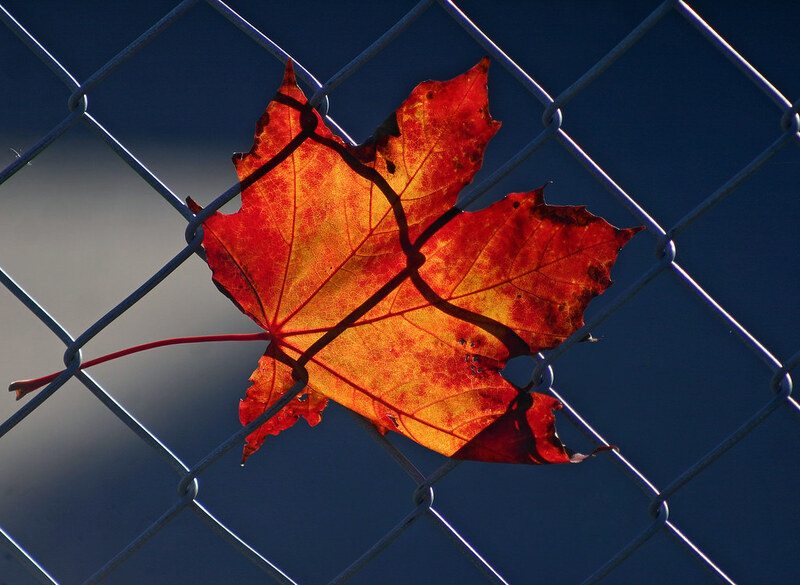 As we passed a sports field in Handen this red maple leaf came flying in the wind and got stuck in the fence so I stopped for a few photos. I like how the shadow of the wire can be seen through the leaf. Second photo is from a nearby park where you will find a fountain and a few sculptures made by PYE Engström. 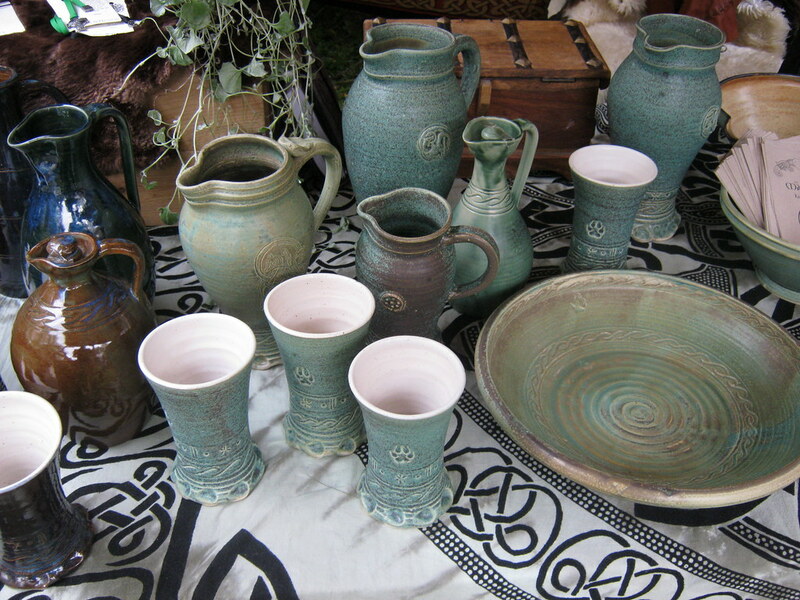 I met a few talented people at the Viking/Medieval Festival. This is one of them. Lena Granberg from Tungelsta. She is the woman to the left. She is an artist and a potter. 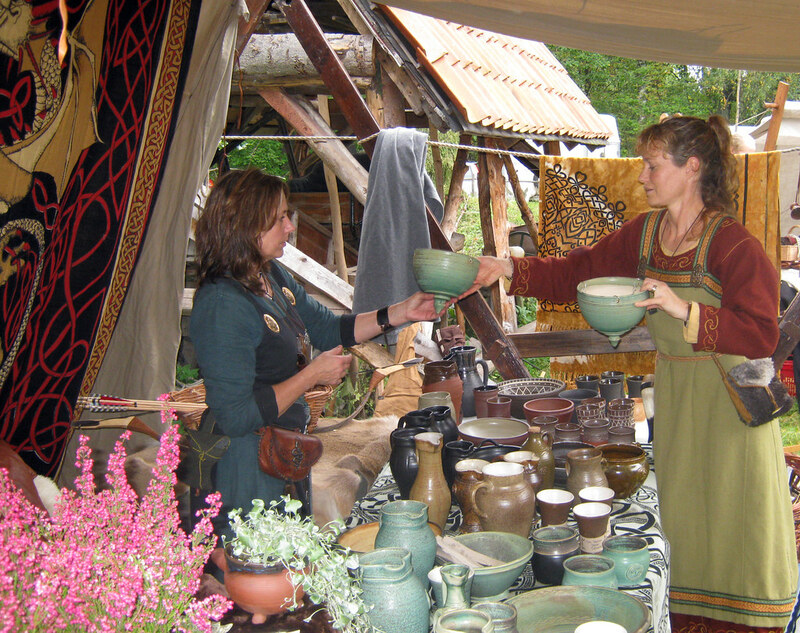 Her handicraft is based on Middle Age and Viking Age findings. She has her own business called Månvind (Moon Wind) where you can order your Christmas gifts! Lena uses modern techniques but tries to keep the design as close to the originals as possible. 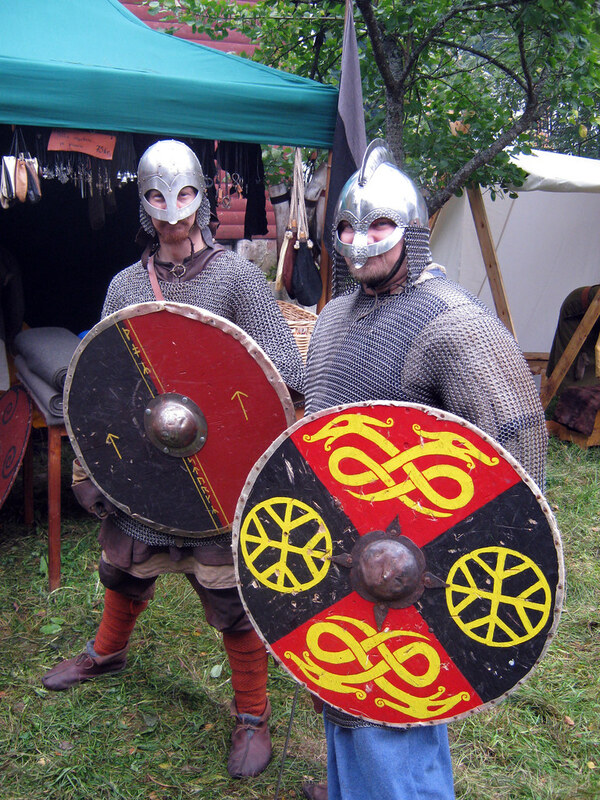 To see more Viking/Medieval photos check out the slideshow where you can also see last years snaps. Performing Medieval music next to a hard working Blacksmith can cause problems. At least for photographers. And possibly for the musicians as well. 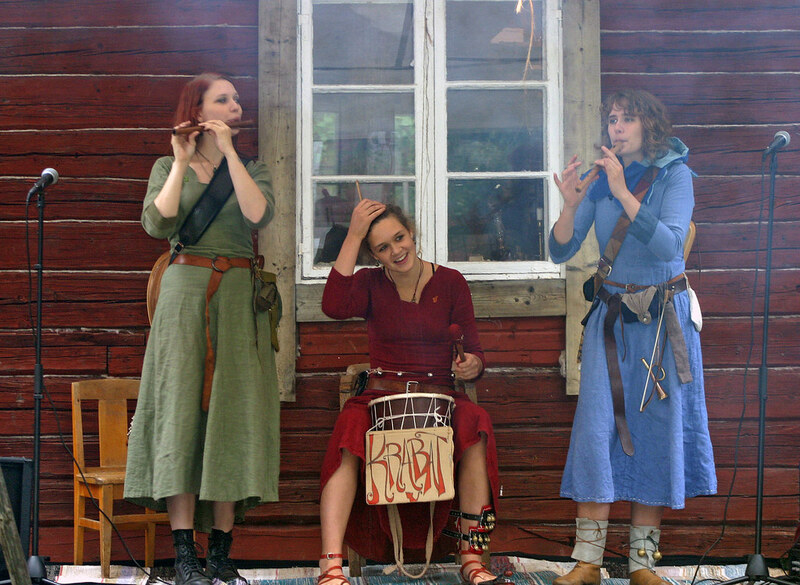 The girls in Krabat nearly disappeared behind the smoke during their gig at the Viking/Medieval festival in Handen. I was lucky to get a few shots when the smoke had cleared out, and after their performance I asked the girls for a portrait. 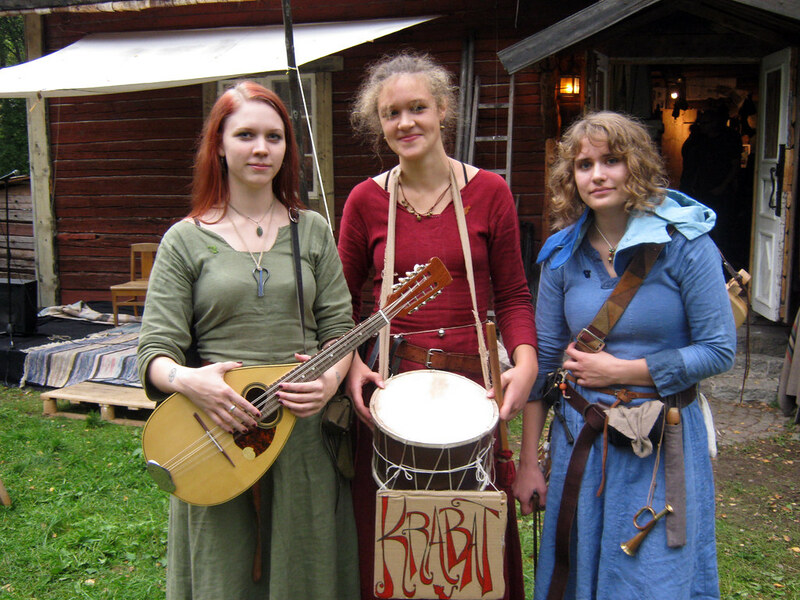 The three members of Krabat are Rebecca Lundblom. She sings and plays the mandola. Greta Nilén, who sings and plays the drums. And Klara Dahlberg. 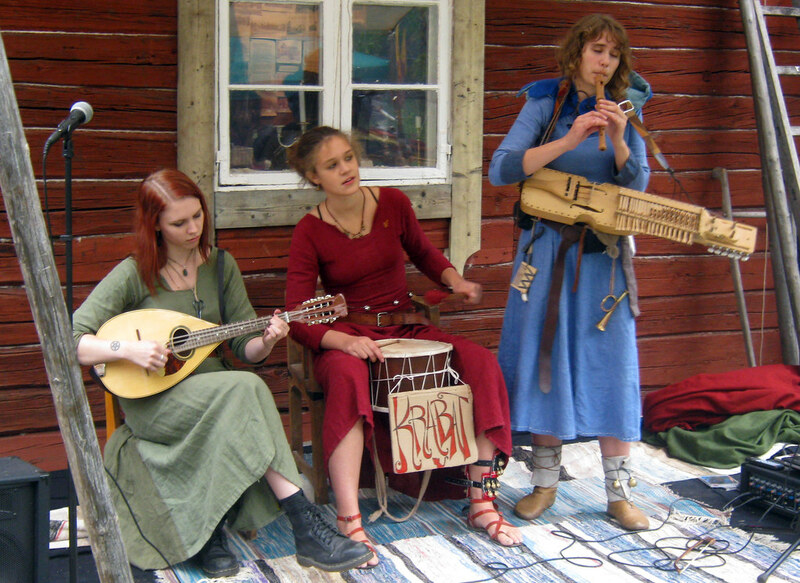 She plays the nyckelharpa and the English flute. They started the band earlier this year and has been touring the country this summer playing at different festivals. If you are interested there are some videos at their Facebook site. The Vikings were a fun bunch of people. They enjoyed drinking and raiding. At least the ones we have heard about. They were fierce warriors and sailed the world on their impressive ships. These days it's a bit different. I met a bunch of friendly (but scary looking), Vikings on Saturday when I visited the annual Viking/Medieval festival in Handen. They put on a great show and fought hard against each other during the day. The Viking on the top photo enjoying a glass of mead is Fredrik whom I met last year as well. His new battle dress was custom made for him and imported from Poland. 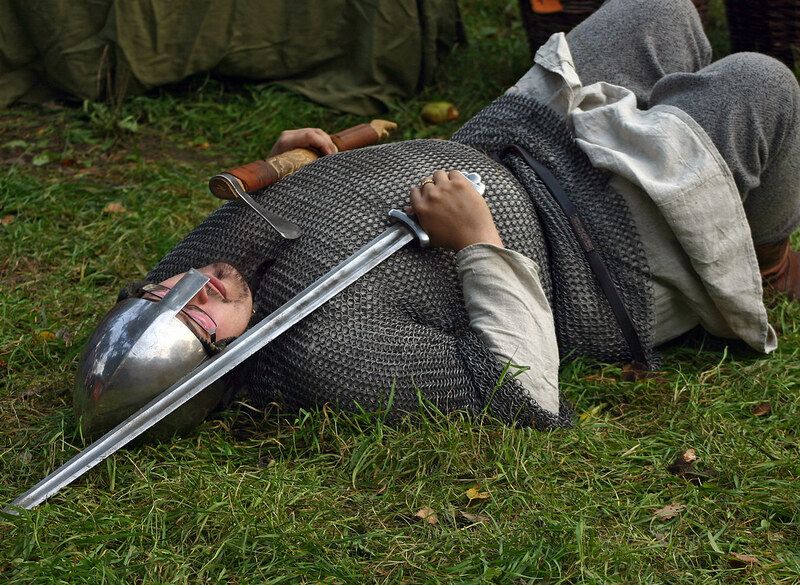 It costed him a few thousand kronor, but as he is a good fighter (he beat me in a few Viking games last year), I'm sure he will get the money back on some raid. 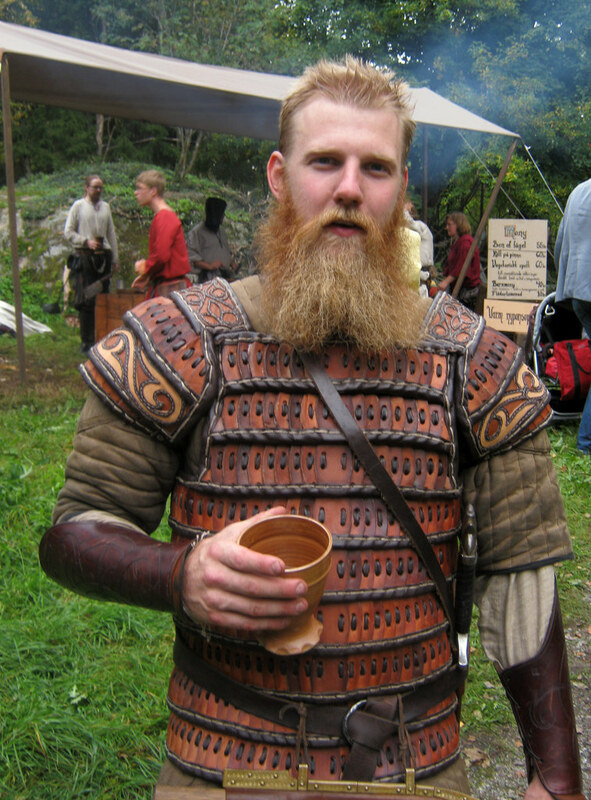 More Viking and Medieval photos to come this week. This is Moa. She is a bit of a free spirit I think. For the moment she lives in Tyresö. Moa works when she has to. At the moment that means doing some interior decoration at a friends office. Whenever she feels like it she will try something new. Moa is a future novelist. She has a few finished books in a drawer at home. A few months ago she sold her apartment. Since then she has been on a few road trips, both in Sweden and in Europe. The last trip took her to Cardiff via Denmark and Belgium. Before that she visited Öland and Hjo in Sweden and she also stayed a few days in Barcelona. Oh, and she told me that she wouldn't take off her sunglasses. Summer is officially over. Since then there has been a few cold and rainy weeks in Stockholm. But that didn't stop Barzin from dressing like Summer was still here. I met him in Handen a couple of days ago. Barzin is a student at KTH, the Royal Institute of Technology. He is studying Architectural Lighting at the Haninge campus. He is originally from Iran and will stay in Sweden for two years. I noticed his shirt and asked if he was a football fan. And that he was. He has two favorite teams, FC Barcelona and Chelsea FC. This is the tree lined avenue in Lida. 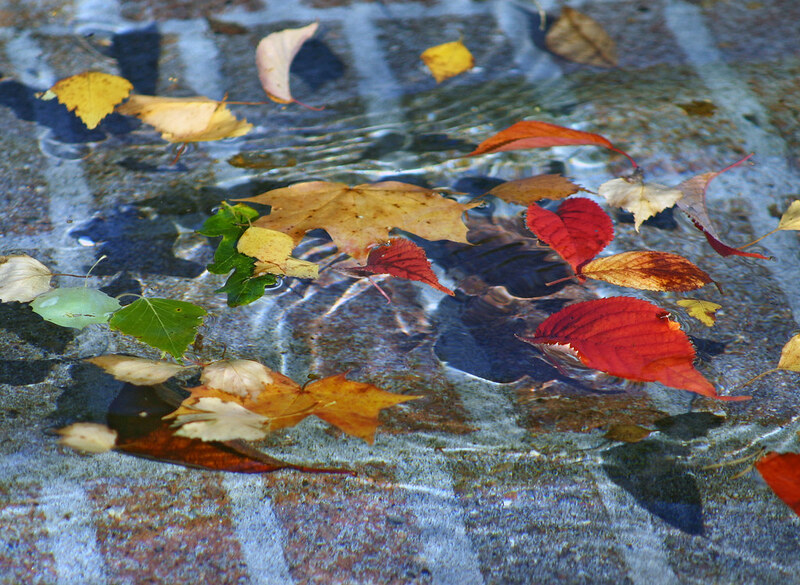 As Autumn is approaching the leaves are slowling changing their color. 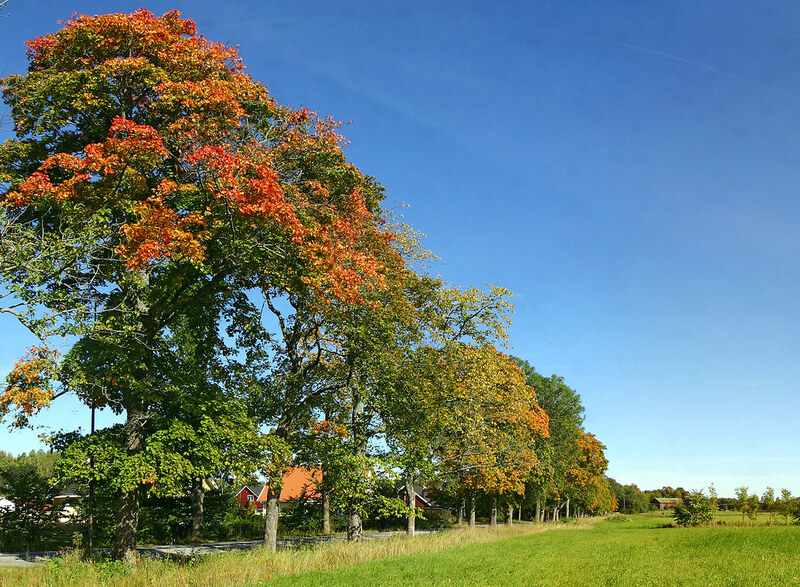 The trees along this road were planted 200 years ago by the owner of the Hammar Estate. I have shown you this road a few times before. It was a beautiful day yesterday and I decided to make a quick stop at Lake Rudan, hoping to shoot a reflection photo, but it was too early in the day for that so I continued around the lake until I saw a young woman sitting in the sunshine on one of the piers. It turned out to be Sara from Västerhaninge. 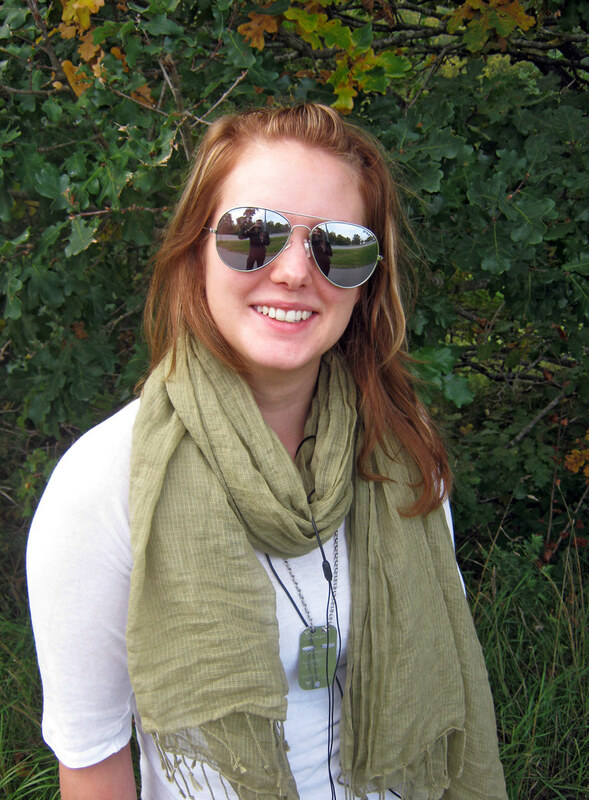 She's a student at the Stockholm University where she is studying Urban and Regional Planning. Sara is a nature lover. One of her favorite places in Stockholm is the Cape of Waldemar at Djurgården. A favorite European city is Barcelona. We talked for a few minutes about this and that and after I had removed a tiny spider from Sara's hair we stood up and stretched our legs and that was that. Apparently it's a good year for mushroom hunting. But you shouldn't try to eat this one. We call it Röd Flugsvanp, in English fly agaric. It's very poisonous, but also very photogenic. Legend has it that the Vikings used it when they went berserk. 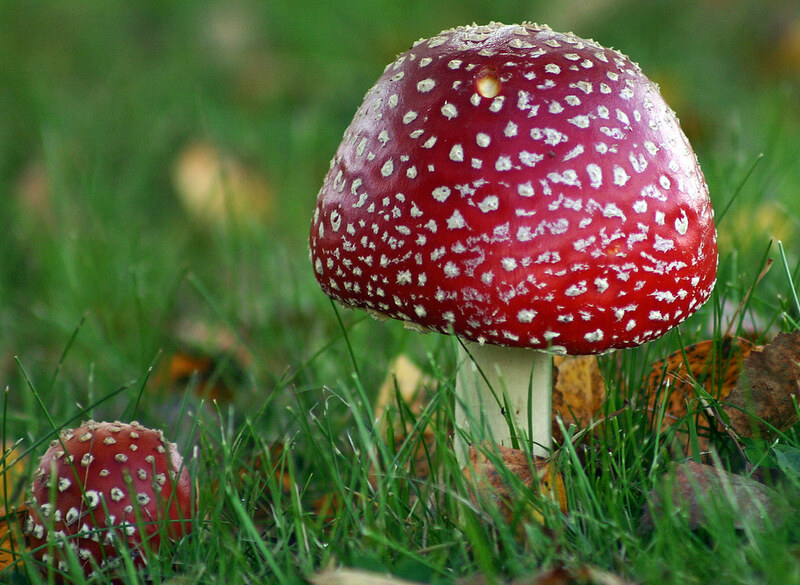 I did meet a group of people at Lake Rudan today and we talked about the fact that a man died from liver failure after eating the white version of the fly agaric just the other day. It also contains muscimol, a major psychoactive alkaloid. Time for another updated Stranger portrait. This is the priest Sara. I first met her last summer when I visited the church where she works as I was hoping to take a few photos from the church tower. Since then we have met a few times. 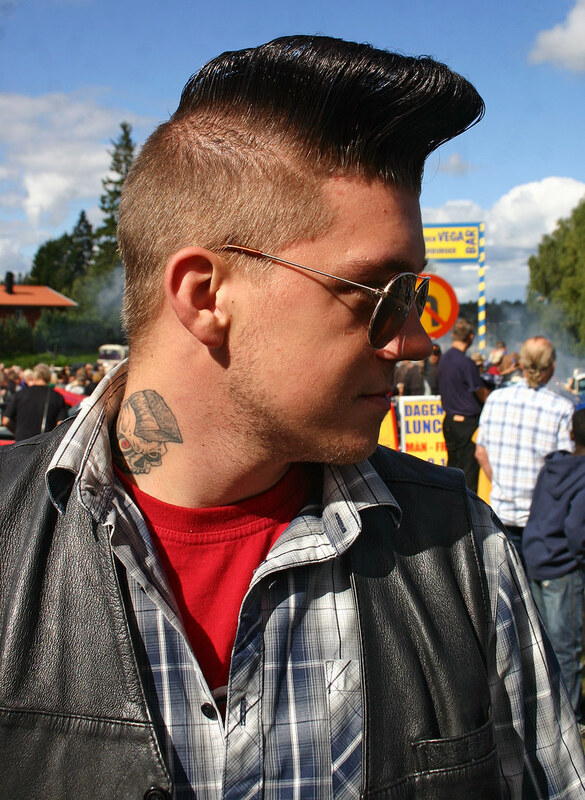 I took this portrait during the Haninge Day celebrations at Lake Rudan last month. We talked for a while and I asked if anything fun had happened since I took that first portrait and Sara told me that she had been interviewed and photographed for the Russian version of Marie Claire since we last met. There are no female priests in Russia so I'm sure she was a big hit in the magazine. 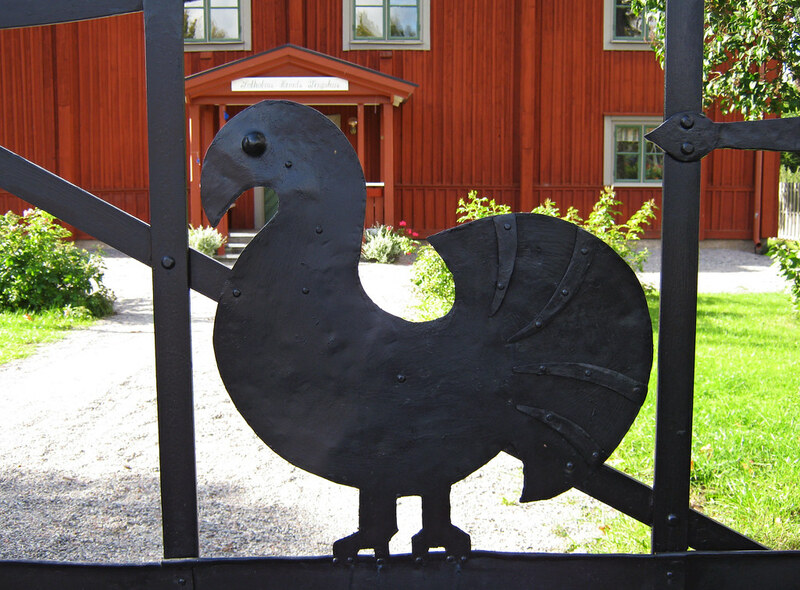 The blacksmith Martin Ahlsén (he is the guy with the museum and the Viking Market), has made the new iron gates at the old alehouse/district court building in Västerhaninge. The building dates back to 1734. 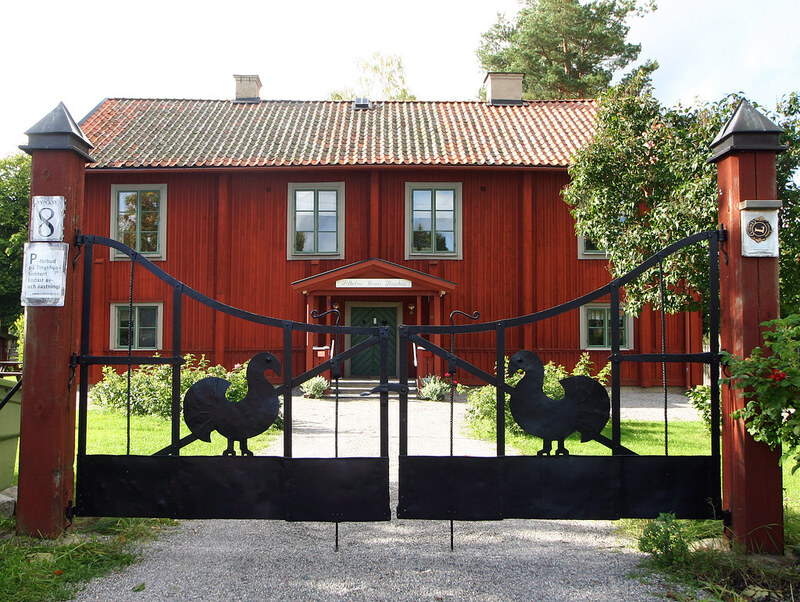 Today it is used by the homestead society, Haninge Hembygdsgille, where I am a member. 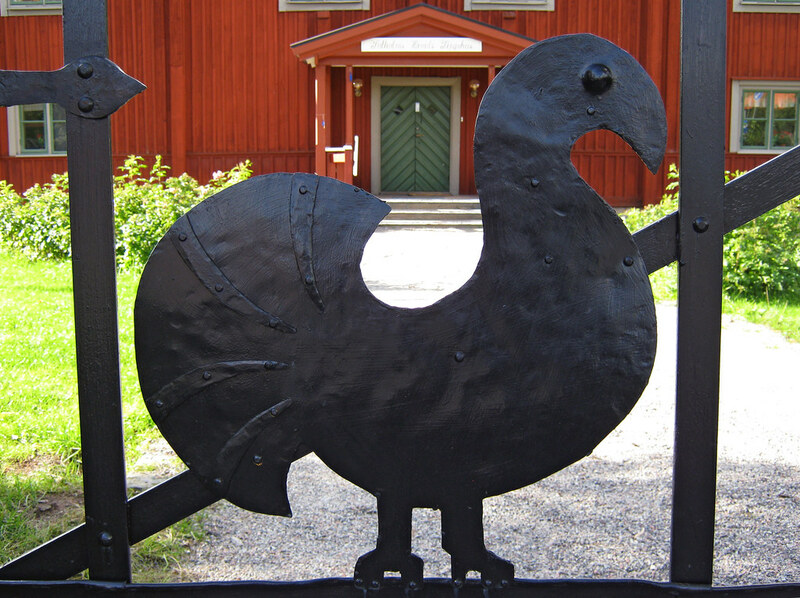 The Wood grouse, or Capercaillie, on the gates is part of the Haninge coat of Arms, and you can see the bird on some of the runic inscriptions in Haninge. To see the old gates press here. It's election day in Sweden today. 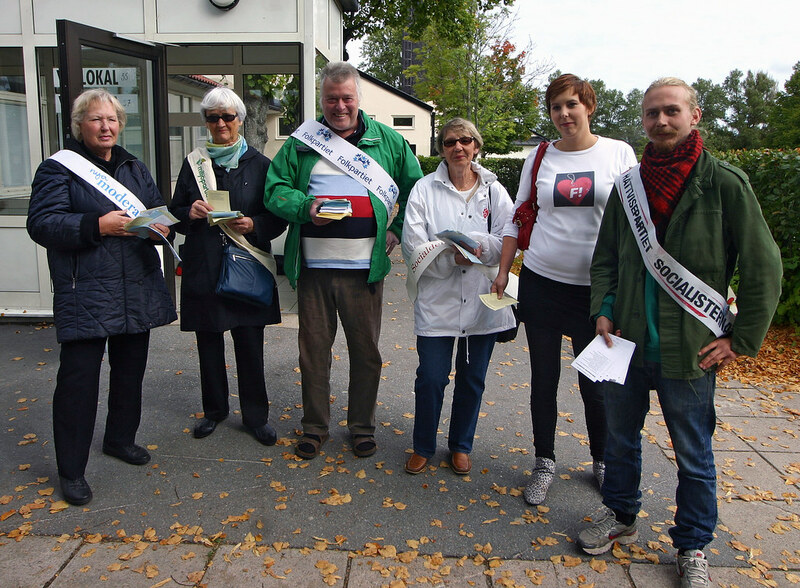 I met these volunteers in Västerhaninge. They were handing out ballot paper to voters. As I took the photo the Mayor came by and commented on the fact that there were mostly women here. The smiling man in the middle representing the Liberal Party had a look at the photo and said that he looked very slim on the picture! The people you see here represents the following parties:Moderaterna. Miljöpartiet. Folkpartiet. Socialdemokraterna. F! and Rättvisepartiet Socialisterna. I bought a very cheap Canon PowerShot earlier this week. A just in case camera, as the old Digital Rebel is having some issues. Always fun to see what you can do with a new camera. This one only costed me 800 SEK. I shot the sky photo with it so that setting seems to work. 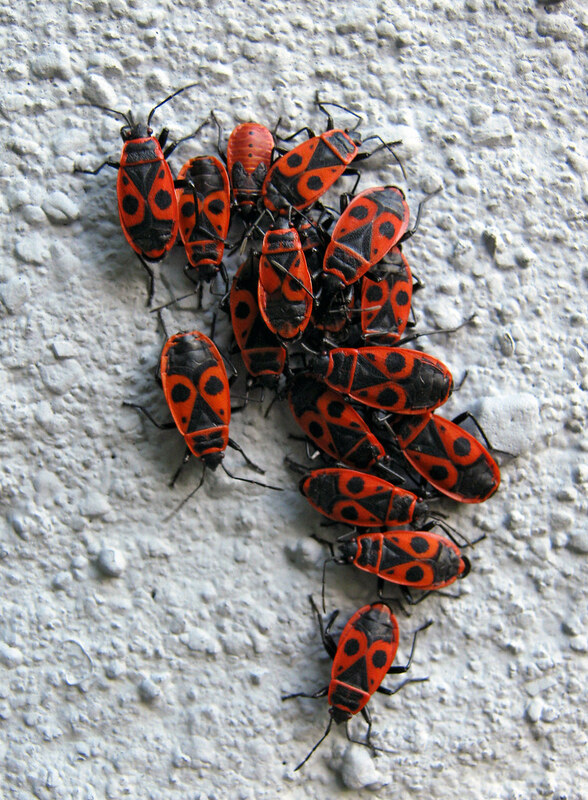 Today's photo shows the fire bugs that lives in the tree trunk next to the cellar door. We call them Eldskinnbaggar and this shot tells me that the macro setting on the camera also seems to work. 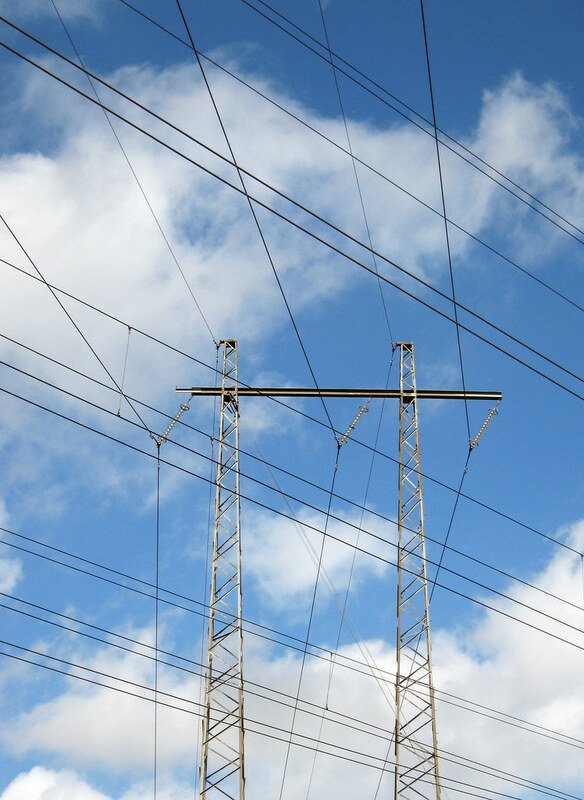 Transmission lines in different directions against a blue sky at the Björklund Horse Farm in Västerhaninge. The railway line Nynäsbanan (between the port city of Nynäshamn and our Capitol Stockholm), opened for traffic back in 1901. A century later it has been a busy construction site for a few years. During the last three summers traffic has been closed when some of the commuter stations have been rebuilt. Close to where I live one new road and two bridges are being constructed, and I have been following the progress every now and then. 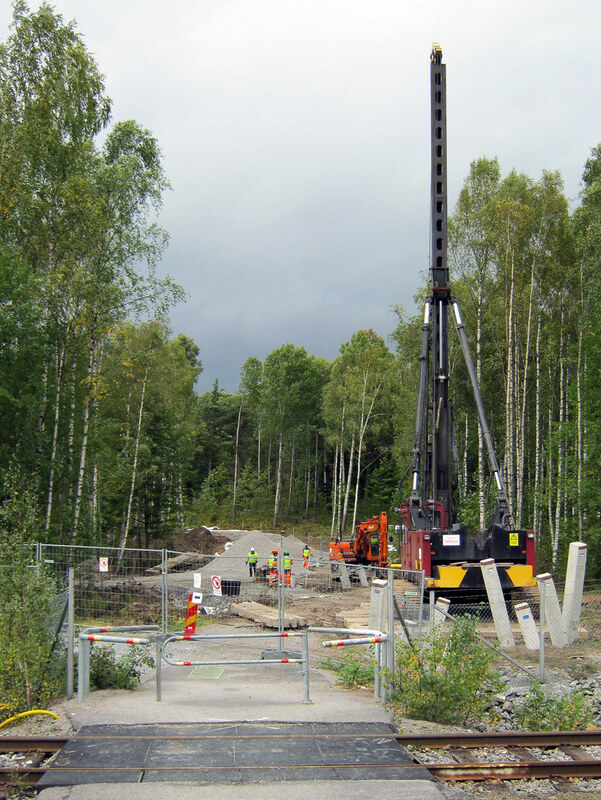 Two weeks ago work began on a pedestrian bridge at Håga in Västerhaninge. The new passage is only a few meters away from one of my previous photo projects, See four photos in one here), so I figured it might be a good idea to grab a photo here once a week or so. It's another rainy autumn day in Haninge so here is another updated stranger portrait. This is Robban. 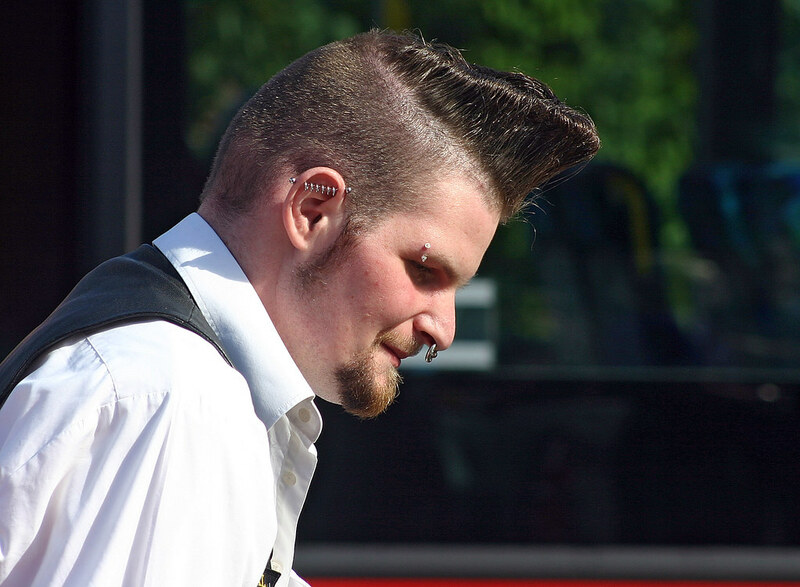 I first met him outside a tattoo parlour in Handen last summer. Back then he had just had his first tattoo made. And as one could guess it wasn't the last. His new tattoo is a skull. This time I saw him at the commuter station in Jordbro as he was on his way home. 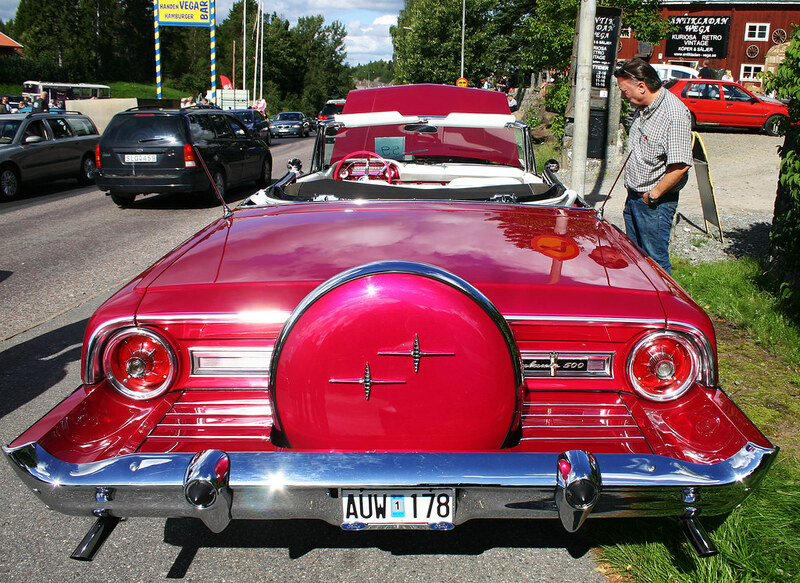 During the summer I have visited the annual Art Promenade in Österhaninge a couple of times. They have a different theme every year. This time it was Paradise. I found the art installations around the gallery garden to be very uninteresting this time, but here is a piece I hadnt noticed before, probably because it wasn't there at all. Just across the road from the Medieval church up on a grassy hill I found this. 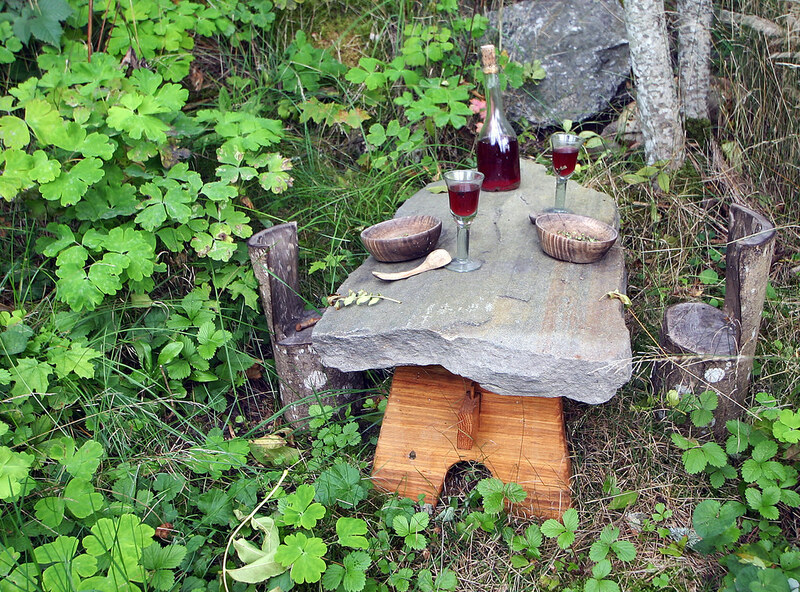 It is called Måltiden, in English The Supper. To see the ten or so photos I have uploaded from this years show check out the slide-show. I might add one or two photos and when I do they will appear in that same slide-show. This past summer was a good one when it came to shooting portraits of strangers. They were everywhere! Back in July when I talked to The Dude and took a new portrait of him, I decided that taking updated portraits of previously photographed strangers was a good idea something to show you on a rainy day,and as it is raining today here is one such portrait. This is of course someone you might remember. This is the beautiful Lejla. She was enjoying lunch on the stairs to the cultural centre, pretty much on the same spot where I took my first portrait of her. We talked a bit about that photo and I laughingly said that I wouldn't mind meeting her here every week and take her photo. Haninge got two new nature reserves yesterday. I visited the ceremonial opening of one of them. Tornberget in Tungelsta. 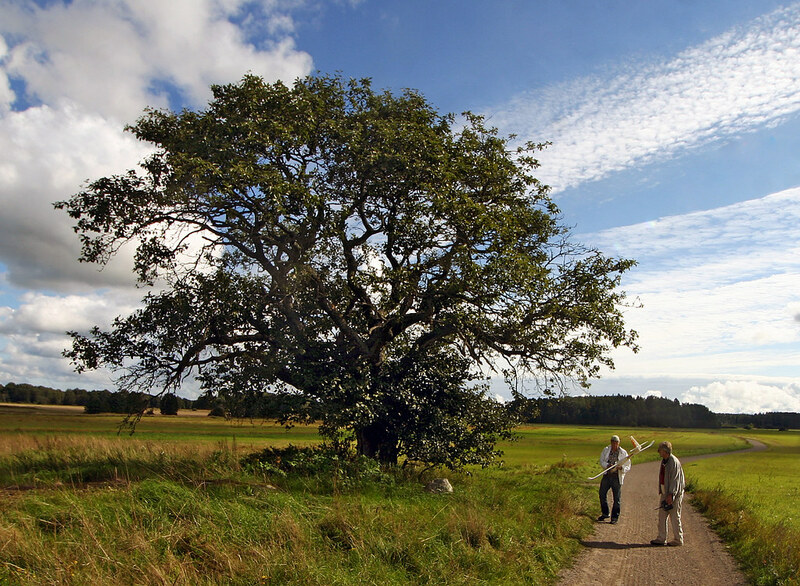 An area that I often visit as it is part of the Sörmland Trail. In the slideshow you can see some of the people that attended the event. A couple of politicians were of course there and you can see Yvonne Radestam from The Green Party in one photo. She gave a speech and unveiled a new information board. If you ever plan to visit Haninge you will need somewhere to stay, and I had a quick chat with the owner of a local Bed&Breakfast. If you took a short walk in the forest there was a quiz to take part in, I had a look at some of the questions and one or two looked tricky. After that hard work there was free hot dogs for everyone! The well known archaeologist Roger Wikell were at hand to inform interested listeners about how this area looked during the Stone Age. He told me he was flying to Spain on Sunday to attend a seminar in santander. 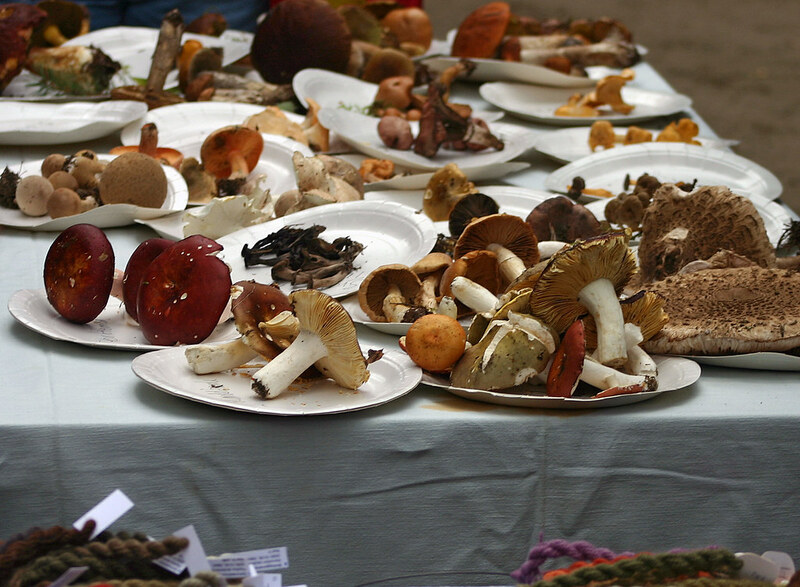 I also met my first ever Mushroom Consultant, a woman called Rut Folke. And as often happen these days I ran into a few people I have previously photographed for this blog. Two of them include The Flute Player and Tarantino's favorite actress. As you can guess I arrived on my bike and heading home I had to stop at the side of the road to photograph the wreck of a rusty old Volkswagen that the municipality for some weird reason had moved from the forest to this new spot. 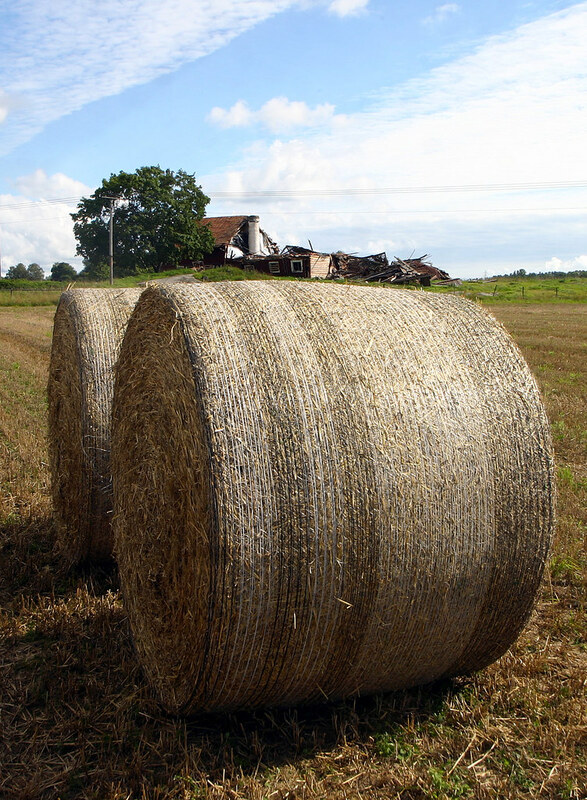 Bales of hay in front of the collapsed barn "Guatemala" at the Nödesta farm in Haninge. I noticed this Super Dimona motor glider while having coffee on the veranda a couple of days ago. I ran for the camera and managed to get a few quick shots. 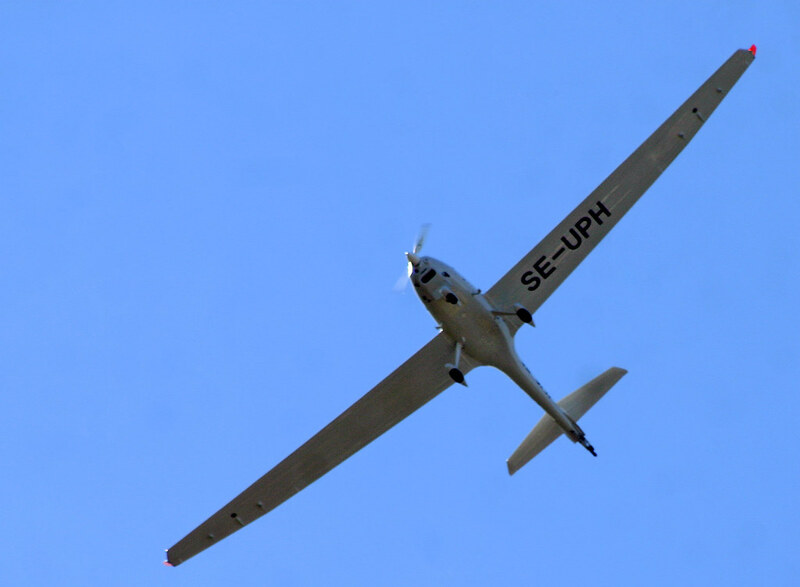 The aircraft registration on this plane is a good one, as SE-UPH also means Look up! This plane is normally used to get a glider airborne. The plane belongs to Stockholms Segelflygklubb and I emailed them a link to my flickr photo, and figured they would like it. They said they did. I noticed a guy with a camera near the Björklund horse farm in Västerhaninge a while back as I came down the gravel road on my bike, so I stopped and asked what he was shooting. Just testing out the new camera was his answer. This is Stefano. He is from Italy. He moved to Sweden from Rome six years ago. When I gave him my card he had one look at it and said, aha so you are Steffe, I have seen your photos. Stefano is very passionate about photography. He shoots with three cameras. One Nikon, one Pentax and now also with the new Olympus E30. I realised recently that I hadn't shown you the old tree for a while. So I yesterday I headed that way. And met these two guys. 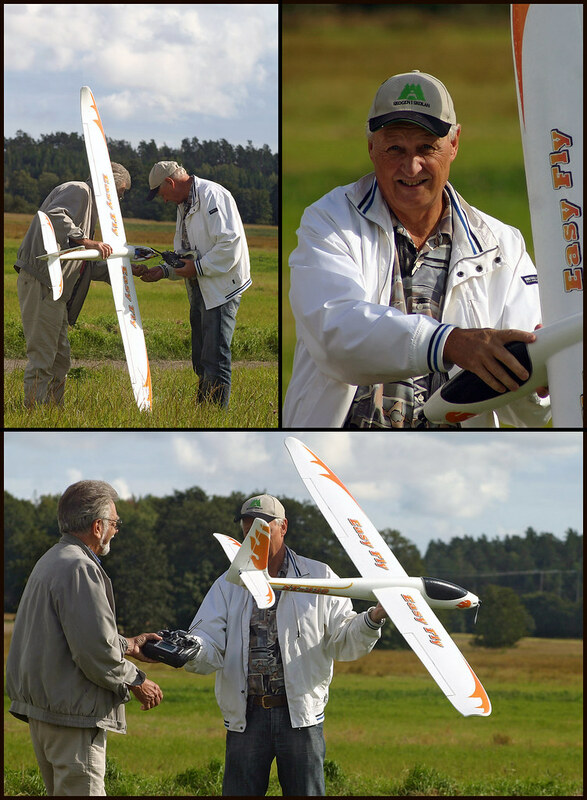 Bengt and Arne were busy putting together this model aircraft so I decided to stick around for a while to see what might happen. This was a brand new plane they told me. It costed around 2000 SEK. There was another plane in one of their cars and a bunch of tools. We used to fly model air-crafts when we were kids they told me. But nothing like this. After ten minutes of preparations it was time to play. I walked away a bit and was ready with the zoom lens to capture the first flight. Unfortunately the propeller wasn't correctly secured so the flight was very short! The guys had to walk back to the car to try and fix the problem so I never saw the thing fly. Whenever I shoot a portrait of someone I have never met before, I always try to get a story. This one will be a bit different. I spotted Paulina at a bus stop in Handen on the same day as I met Kristina Matilda. I asked her if I could take a photo and she happily agreed. But then we noticed the bus coming and gave up on the shoot, only to realise that it wasn't her bus! By then I was already moving away, but turned around and we started over. Normally I will get the facts first, but on this occasion I gave Paulina my card and started shooting. Unfortunately for me Paulina's bus did arrive ten seconds later. So I only got her name, but who knows maybe I will see her again some day. 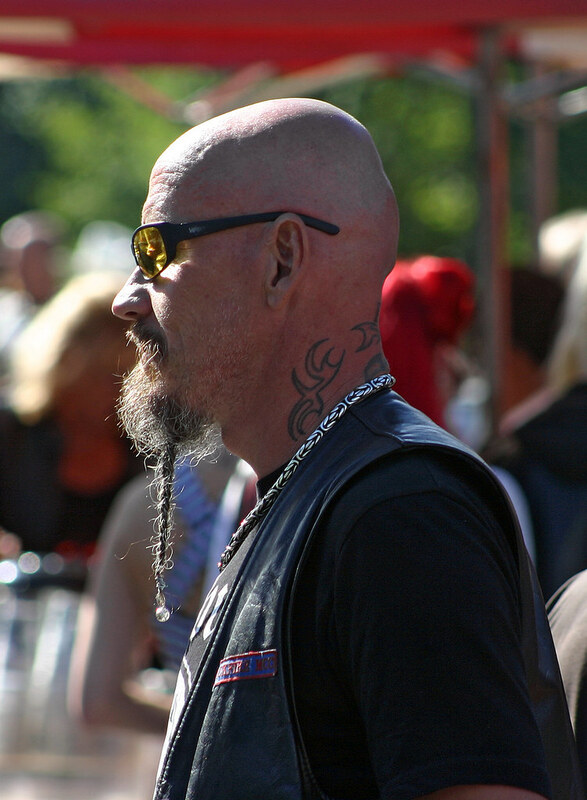 I visited the Easy Rider Festival in Handen on Saturday. Held at the same place as the car meet the weekend before. The place was crowded with bikers and cool bikes. 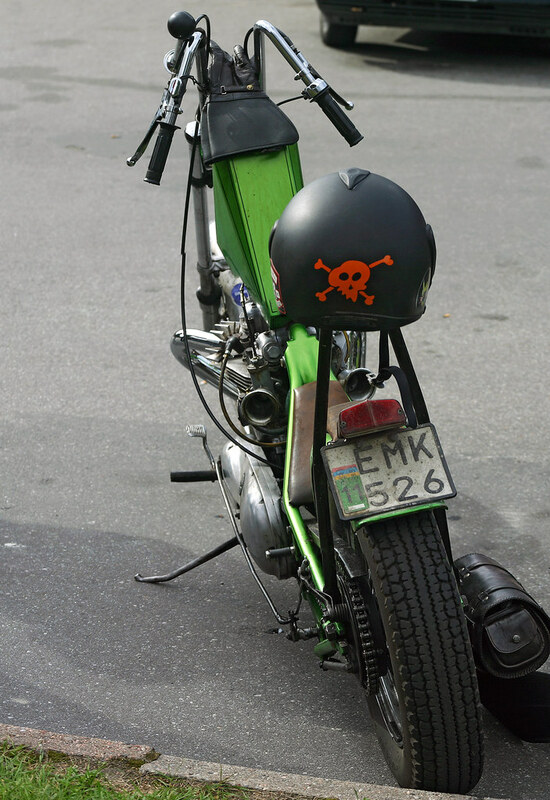 Like this green chopper from Carolina MC from Stockholm. It's a Triumph from 1968.They have a great motto in this biker club. Laugh, enjoy a beer and be happy. 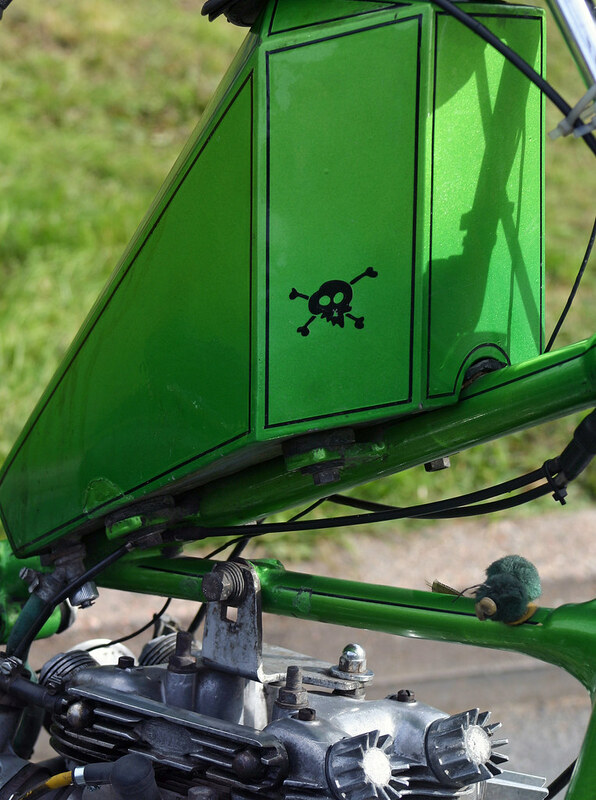 The chopper belongs to Ratte. My friend Jim took an unusual vertical panorama photo of this bike. The rule says that I must take a photo of these types of things (deeley boppers). 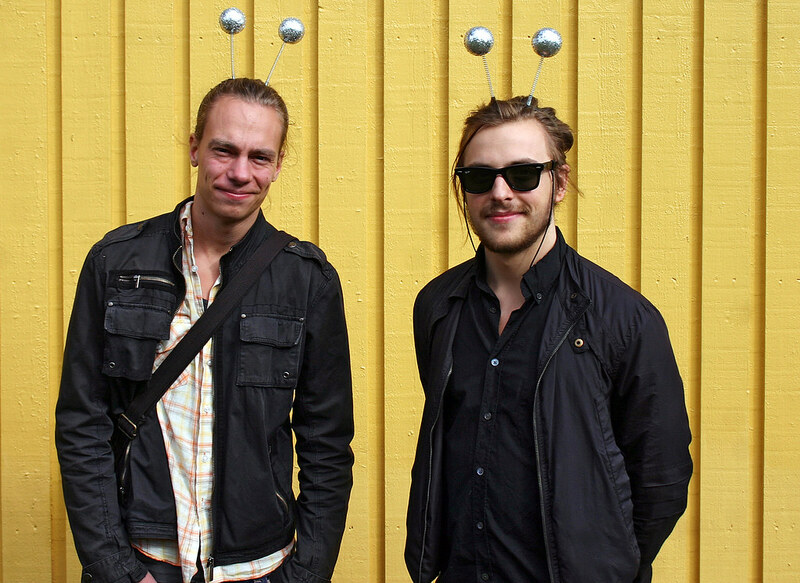 So that's what I did when I spotted Kristoffer (from Stockholm), and Benjamin (from Gotland), in Handen last week. This is apparently how you look when you are a first year student at The Royal Institute of Technology . Three years from now these guys will graduate from the Haninge campus as high school engineers. Despite some camera trouble I did get quite a few good photos at the cruiser meet as you might have seen during the last few days. I could go on and show you a photo every now and then, but I decided that it was better to finish with one typical photo and a slideshow with around 80 photos. 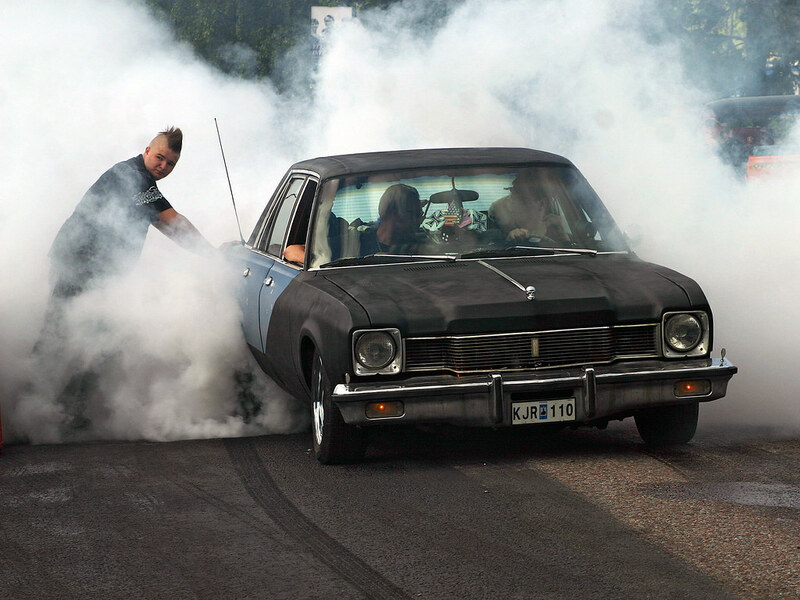 This guy here sure loves the smell of burning rubber. He was out on the street for about one hour "helping out" anyone that wanted to play. The police came by once or twice, but there was never any trouble. There's always a contest at the cruiser meet at Vegabaren for best hairstyle. You normally need a lot of brylcreem to win that title. If you are very clever (and I know that some of you are), you might figure out who out of these three dudes participated in that contest. There were many dressed-up women at the cruiser meet, some of them hoping to win the title Best Dressed Raggarbrud, a contest that Annika (seen on this blog the other day), had won two years running. This is probably one of the more photogenic babes. Her name is Anna, and it's hard not to notice that skull tattoo on her leg, I certainly didn't. Anna lives in Handen and I have met her before. In case you are wondering, Anna drives a beautiful white Cadillac. There was a professional photographer at the meet. 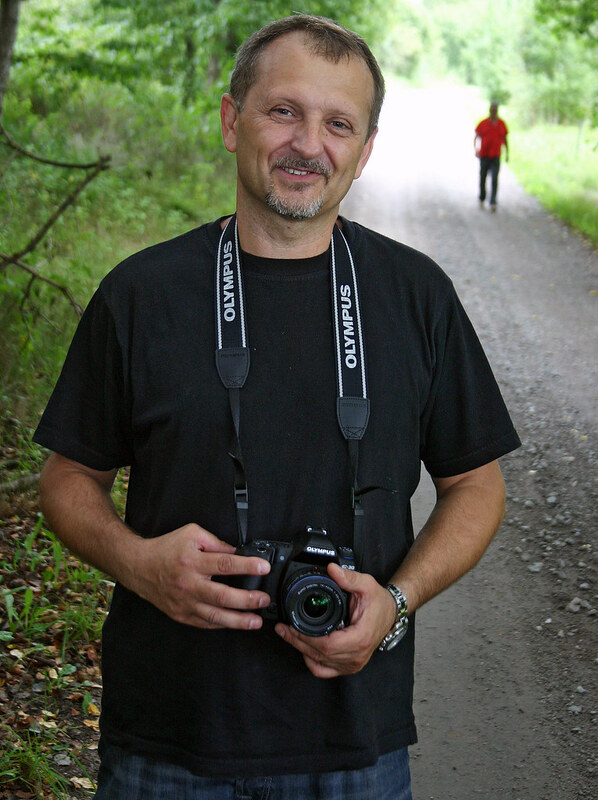 Per-Olof Sännås. 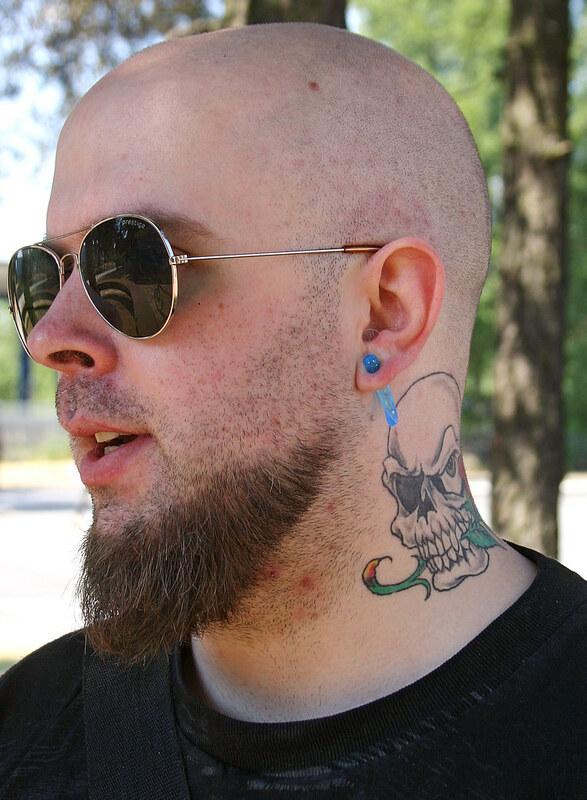 He is currently working on a book about raggare, and he took a very cool photo of Anna where she is lying in the grass with a classic car in the background and this tattoo was the main focus. No name on Anna's friend, but I have a very cool photo of her at flickr. One word can describe this car. Wow. Probably my favorite from the cruiser meet. This is a 1964 Ford Galaxie 500. And what a color it has. The owner was busy all day telling people all about this car. 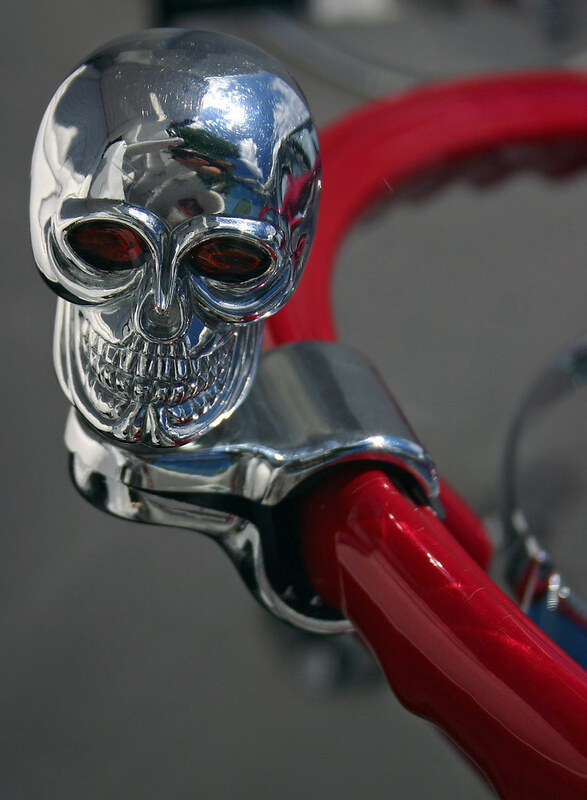 I had a closer look at the steering wheel and decided to take a photo of the chrome skull steering wheel spinner knob.